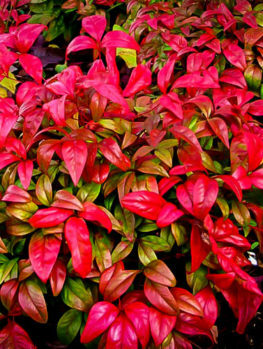 Compact Nandina is a smaller form of the well known Nandina plant, or Heavenly Bamboo. It grows just 4 or 5 feet tall, rather than the 8 feet of the full-sized plant. It is very similar in habit, and just as reliable for easy gardening, but its shorter size makes it perfect for smaller spaces. It grows in almost any soil and thrives anywhere from sun to shade. It has upright cane-like stems with a cloud of tiny leaves around them, creating an attractive ferny look. Despite its delicate appearance this is a very hardy plant, tolerating some drought when well-established, and free of pests or diseases. It needs no care, yet it rewards you will changing foliage colors through the seasons. In spring the new leaves are bronzy in color, turning an attractive soft blue-green in summer. In fall they turn great shades of brilliant red, which lasts all winter. 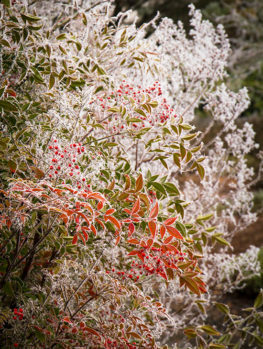 As well, plants produce sprays of white flowers in spring, which turn into large clusters of bright red berries by fall, lasting through winter. 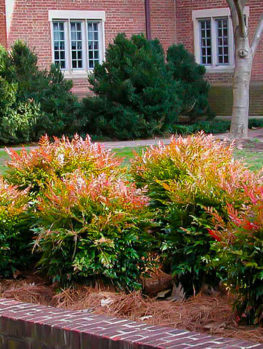 Grow the Compact Nandina in any well-drained soil, mulching each spring with organic material. Use it to fill the space beneath larger shrubs and trees, or as part of the planting around your house. It is especially useful on the north side of buildings, where many other plants will not grow. Use it as a substitute for bamboo in Asian-themed gardens, especially smaller ones, creating a similar look, without being invasive. It also grows well in large pots, and looks lovely on a terrace or patio, bringing height and interest, and making an elegant alternative to annual flowers. Nandina, or heavenly bamboo, is one of the most useful plants for gardening in mild to hot areas. It grows in full sun or partial shade, as well as in full shade. It is moderately drought resistant, and its fern-like evergreen foliage makes a strong impact, with a light and airy look. The normal form of this plant can grow 8 feet tall, and 4 feet wide, making it a bit large for a small garden, and many other forms are only a foot or two tall. What is needed is something in between, and the Compact Nandina is exactly that. 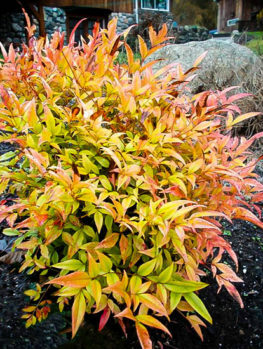 Very similar to the ordinary Nandina, but a little denser and more compact, never going above 5 feet tall, and only 2 feet or so wide, it is the perfect choice for a smaller garden. 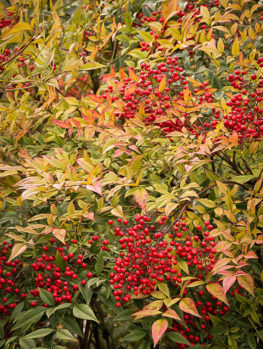 With its airy appearance, complimented by red berries, and with its winter foliage turning red too, there is always something attractive to see on this plant. It is also very easy to grow, so it’s ideal for creating an attractive, but minimal maintenance garden. It will grow in almost any location, so those awkward questions like, ‘is there enough sun?’ or, ‘is this spot too shady?’ really don’t matter. Planted almost anywhere, it will thrive and give its best to you – a very attractive best. 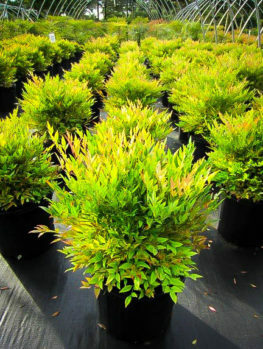 Compact Nandina resembles bamboo, with a cluster of upright stems, rising straight from the ground, without branching. The leaves are very large, but because they are divided into many, many small leaflets, the effect is like a mass of small leaves – a leafy cloud. They are an attractive soft, slightly bluish green, and in fall, when colder weather arrives, they turn beautiful shades of red. This lasts all winter. In warmer areas the leaves are completely evergreen, but in zone 6 they often fall during the coldest weather, and then re-sprout in spring. New spring leaves are coppery in color, soon turning green as they expand. Older stems produce sprays of white flowers in spring, which gradually turn into bright-red berries, in large clusters, which last well into winter, and sometimes until the following spring. They make a lovely show for months in the garden. 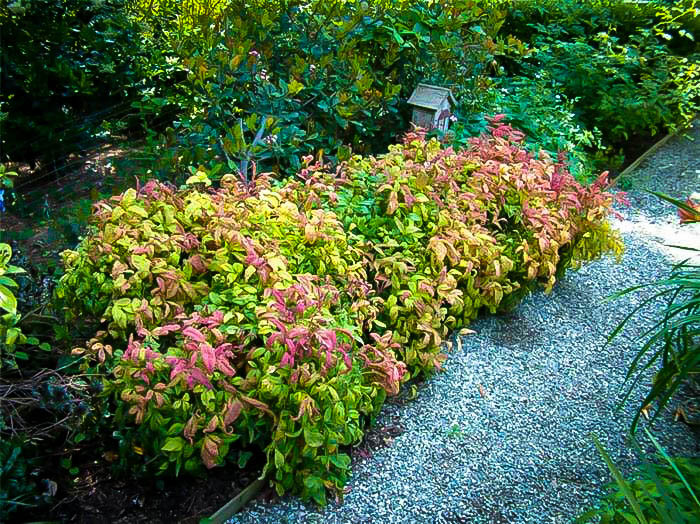 Compact Nandina will grow well in all the warmer redions – including zones 7, 8, 9 and 10. In zone 6 it will be partly or completely deciduous, but still be an exciting addition to any garden. It will also grow in warmer parts of zone 5, but some stems may be killed, with the plant re-sprouting from the base each year. Because if this it will probably only grow one or two feet tall. Even so, the novelty of growing such a plant in colder areas, and its attractive appearance, makes it very worthwhile for gardeners in those cooler areas. In climates with lots of cloud and rainy weather, it will grow best and produce more berries in sunnier spots in the garden. Water it regularly when young, but once established this plant will survive short periods of moderate drought. It will always grow better with adequate supplies of water. It grows well in almost any kind of soil and does best with the addition of organic material when planting, plus an annual organic mulch over the root zone. This plant is normally completely free of pests or diseases, and always easy to grow. 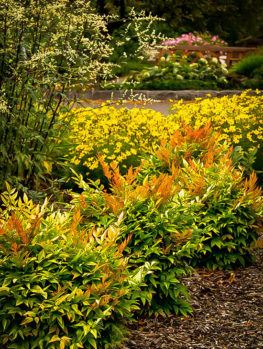 Use Compact Nandina for any location from full sun to full shade. Fall color and flowering will be best in sunnier spots, but the plant itself will grow well even in completely shady parts of your garden. 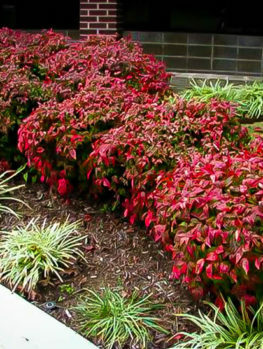 This makes it an ideal plant for shadier corners, such as under larger shrubs and trees. It fits well into all styles of gardening, and it is especially useful in Japanese themed gardens, where it makes an excellent substitute for bamboo, which can often grow too large, and become invasive in small gardens. 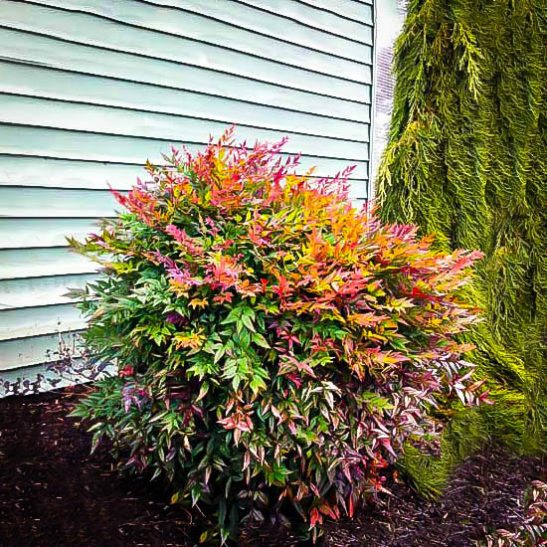 Plant it too around your home, among the evergreens and other foundation plants – it adds textural interest and it is a wonderful choice for the shadier corners and along the north side of a building. Compact Nandina is a native tree of Japan, China and India where it is called Nandina domestica, which is taken from the Japanese name for it – Nan-ten. It has been grown in western gardens in Europe and North America for over 200 years. During that time many plants have been grown from seed, and some which grew smaller than normal were selected and named ‘Compacta’. This is the origin of our plants, which are grown by division to be sure they retain that compact habit. Cheaper seedling plants will grow much larger, and they are not going to be this very useful smaller form. 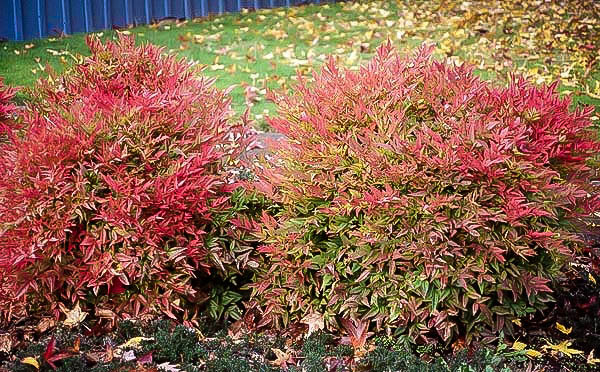 Because of the popularity of this plant, we know our top-quality stock will not last long, so order now, and grow the wonderful Compact Nandina anywhere in your garden.